1. Scrub the clams well in cool water, pile in a large deep kettle, add the cold water andsalt. Let the clams stand in the cold water about 1 hour. 2. Chop the garlic. Slice the onion, pepper and tomato into rings. Slice the ham in thin strips. 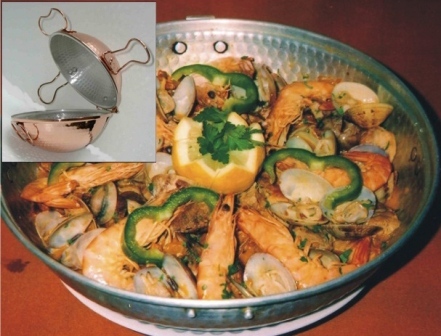 Take a cataplana (if you don't have one, use a large heavy saucepan with a tight fitting lid). Cover the bottom with onion rings. Then add chopped garlic, sliced pepper, tomato, and sliced ham. 3. Mix together 4 the olive oil, white wine, salt, sugar, pepper, and Tabasco sauce in a separate bowl. Pour the mixture over the vegetables and ham in the saucepan. Cover with the lid and bring to a boil. 4. Rinse the clams under the tap and add them to the saucepan. Cover and cook slowly for 8-10 minutes. When ready, toss together serve immediately. 5. 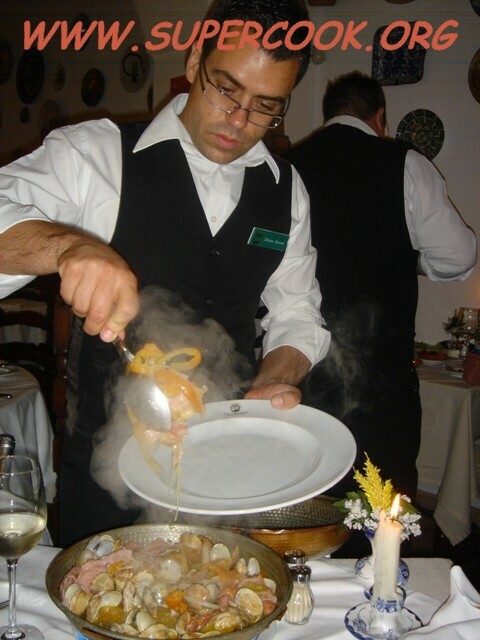 The dish is served in the cataplana or the saucepan that was used for cooking it.Carry the cataplana to the table, open, and ladle into large soup plates. Be sure to put out a large bowl for empty clam shells.